The Markets for Force constitutes an invaluable resource for scholars and policymakers alike, The book offers both an empirical analysis of variations in private military and security companies across the globe (Argentina, Guatemala, Peru, Ecuador, the United Kingdom, the Czech Republic, Ukraine, Russia, Afghanistan, China, Canada, and the United States) and deeper theoretical knowledge of how such markets develop. 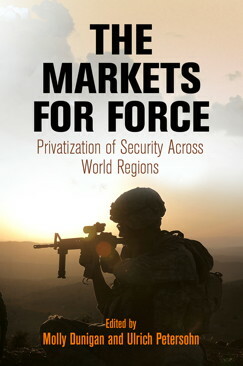 The Markets for Force examines and compares the markets for private military and security contractors in twelve nations: Argentina, Guatemala, Peru, Ecuador, the United Kingdom, the Czech Republic, Ukraine, Russia, Afghanistan, China, Canada, and the United States. Editors Molly Dunigan and Ulrich Petersohn argue that the global market for force is actually a conglomeration of many types of markets that vary according to local politics and geostrategic context. Each case study investigates the particular characteristics of the region's market, how each market evolved into its current form, and what consequence the privatized market may have for state military force and the provision of public safety. The comparative standpoint sheds light on better-known markets but also those less frequently studied, such as the state-owned and -managed security companies in China, militaries working for private sector extractive industries in Ecuador and Peru, and the ways warlord forces overlap with private security companies in Afghanistan.